I freely confess here that I love using my computer, tablet, and phone to connect with others and to gather information. I do indeed feel lost if I am not able to look something up with just a tap or two on a screen. However, I am not so much of an addict that I need to be plugged into the digital world all the time. I love being out and about in the real world as well. In this picture book we meet a little girl who loves her gadgets so much that she ends up getting a case of digital overload. Dot’s mother decides that what Dot needs is to go outside to “Reebot! Recharge! Restart!” It is time for Dot to connect with the world in a different way, but does Dot remember how to be an unplugged little girl? In this delightfully clever picture book we meet a little girl who is very skilled when it comes to using electronic devices. The hard part is that she also needs to remember that there is more to life than living in a virtual world. There is a real world to be enjoyed too. With a minimal text and expressive artwork, this picture book conveys a message that we all need to hear once in a while. Usually on Fridays I post reviews of poetry book collections, rather than reviews of books that contain one poem. Today I am going to make an exception because the poem is so timeless and the way it is presented is to powerful and beautiful. The poem is If by Rudyard Kipling and this is a book that will appeal to readers of all ages. What parent does not want his or her child to be happy in life, and to reach his or her full potential? This is the wish of millions of parents all over the world, and has been the wish of parents long gone for children who are also long gone. Rudyard Kipling was just such a parent. He wanted so much for his only son, John, and he also had many aspirations for him. The advice offered in the poem is universal in nature and if readers are truly listening, they will find that the poem speaks to them, no matter how old they are. It does not matter if you are a student, a parent, or a grandparent, Kipling’s words will resonate with you and give you cause to reflect. Throughout the poem the word “If” appears, a constant reminder that we are in control, that we can choose what we do. “If you can trust yourself when all men doubt you” and “if you can wait and not be tired by waiting” then you will come to a place where all things are possible. “If you can dream – and not make dreams your master,” and “watch the things you gave life to, broken, / And stoop and build ‘em up with worn-out tools” then you will prevail. Again and again we are reminded to be true to ourselves and to let the words of naysayers and critics pass us by. Throughout the book Kipling’s powerful words are accompanied by beautiful, emotive watercolor illustrations. People who don't love books and the written word sometimes find it hard to understand the relationship that we bibliophiles have with our favorite books. These books becomes our friends and we turn to them when life is hard. We cherish them even when they are falling apart and looking rather sad and shabby. In today's picture book you are going to meet a book that was once loved but is then forgotten. The book becomes lonely and lost. There once was a book that was very popular with the children who came to the library. Even when it was no longer new and was on the shelves instead of being in the new book section, this book was still taken out of the library often. Years and years passed and the book wasn’t as popular as it once was. The book’s cover was faded and the last page was missing. One day the book was taken off its shelf and it was dropped in a “dark corner by a daydreaming child.” The librarian failed to see the book and it lay where it had fallen until a little girl called Alice came along. Alice looked at the book and fell in love with it. Even though the book was old, Alice wanted to take it home with her, and that was what she did. Alice read the book over and over, and she even shared it with her classmates at school. The book, so long forgotten and lonely, “Had never felt so beloved.” It was happiest when children were reading its story and looking at its pictures. It was happiest when it was with Alice. Then, but sheer mischance, the book got misplaced and it was separated from Alice, which made both the book and the child very unhappy. In this splendid picture book we celebrate the love that a child can have for a book. There is no way to predict which book will become a favorite, but once it has been chosen, a book’s child will never forget it. With a wonderful story and delightfully soft and expressive artwork, this is a book that will surely capture the imagination and hearts of many children in the years to come. I live in a town where there are some lovely vintage cars and also some downright bizarre looking vehicles. None of them, however, are as bizarre as the cars you will read about and see in this picture book. This book of poetry is a must for any young readers who have a fondness for cars. When I was younger I was quick to judge others. I have since learned (the hard way) that such judgements serve no purpose and can be unkind. When someone is disagreeable I remind myself that the person probably has some sadness in his or her life that I know nothing about, a sadness that makes them behave as they do. In today's book you will meet a yeti who is grumpy and who is therefore friendless. No one who sees the yeti imagines that he his kind and gentle on the inside. Deep in the forest there lives a very large, very white, and very hairy yeti. Since he is so big, so hairy, and so scary, the other animals keep their distance, and Yeti is alone all the time. And lonely. Then one day something lands on Yeti’s head. The something is a very confused orange bird who has a great deal to say. She sqwalks and sqwalks until Yeti roars at her, but instead of being afraid of Yeti, the bird is amused. She then tells Yeti all about her journey and explains that she has “landed on a hot, tropical island” where she will spend the winter. The yeti then points out that there are no palms trees in the forest, and no sun for that matter, which is when the bird realizes that she has made a big mistake. She is in the wrong place and is lost. The yeti tries to console the bird and then, not knowing what else to do, he picks her up and takes her home. Soon the two animals are the best of friends and everyone in the forest is amazed to see that the yeti is a cheerful fellow and a wonderful friend. In fact he is such a good friend that he decides that he has to find a way to help the little bird continue her journey south. Keeping ones pets happy should be easy, but actually it can be rather complicated at times. Especially if ones pet is unusual. We had a potbelly pig for a pet for a number of years. At first Gracie was a very easy house pet to care for. She was house trained in just a few days and was very intelligent, which meant that she learned the rules very quickly. Then Gracie's urge to root took over and she became very destructive. We then had to make sure that she had rooting time outdoors every day so that her rooting instinct was satisfied. In today's book you are going to meet a wide variety of pets and you will learn what these pets need to be be happy. Many of us know all kinds of things about animals. We know that cheetahs are the fastest land animals and that whales are not fish. We like to think that we know a lot about the animals that we keep as pets too. We know that cats like warm places to sleep, that dogs like companionship, and that pet rats need to be kept busy because they are intelligent. However, there are some things that perhaps we should know about animals that we don’t. Thankfully, the author of this book has kindly written down a few tips and suggestions to help us. 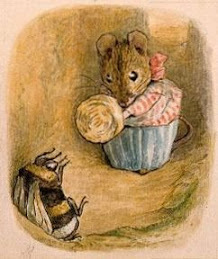 If you have a bee for a pet and if she is “feeling down,” the author suggests that you offer her a crown. Wearing a crown helps the author when she is “feeling blue,” so maybe it will help a pet bee too. In all there are twenty-two little poems in this book, each one of which is accompanied by a whimsical painting. As they read the poems young readers will find out how to care for their pet porcupines, baboons, pelicans, ponies, cockroaches, goats, and other animals. The author uses humor and a clever use of language to create poems that will delight readers who have a fondness for animals. Most children, at some point, decide that they cannot stand being at home. They get it into their heads that they are not appreciated or understood, and the only thing they can do is to run away. I remember the day I did this. I managed to get about four blocks from my house before I sat on the curb, a picture of misery. In today's picture book you are going to meet a little girl who decides to run away to Africa, and who finds a wonderful companion to take her there. Loula is afflicted with three brothers who are “MEAN, HORRIBLE,” and to add insult to injury, they are also “STINKY.” One day she decides that she has endured as much as she can take, and she announces that she is leaving home. She packs a little suitcase and heads down the stairs to begin her journey to a place that is far away from the dreadful triplets. Loula tells her mother and father that she is going to Africa, but both of them are far too busy to take what she is saying seriously. Which is very annoying. So annoying in fact, that Loula decides that she will never come back. Why should she. No one cares about her. Loula climbed a tree, which is where Gilbert the chauffer finds her. When Loula tells him that she is in Africa he informs her that she has made a mistake. They look at a map together and then Gilbert tells the little girl that she will need to travel on a ship to get to Africa. Gilbert pretends that the family car is the ship and he takes Loula on a journey that turns out to be wonderfully exciting. Most of us experience days when nothing goes well. Machines break down, people are mean, and life has a grey pall hanging over it. This picture book is perfect for days like this, for days when one feels like running away from home. Children will be charmed by Loula’s adventures with Gilbert, and they will appreciate that all Loula really needed was a little love and attention.